Ugenie is a new online shopping aggregator developed by two former Amazon executives. Most shopping sites that come along bore me to tears but this one is fascinating. The site considers how much each item would cost, bought individually or in combination with your other items, at 35 different online market places. If you are searching 35 vendors for 3 items, then that’s 35^3 combinations – or 42,875 permutations. The service can handle bundles of up to 15 items. More than just metasearch, Ugenie searches the vendors in real time and ranks them based on bottomline prices that take into consideration shipping, taxes and any coupons that can be found online. If you are likely to save more money by buying another item the site thinks you will like, it will recommend a bundle with those items included. It then takes you step by step through purchasing your items from various sites offering the best deals. 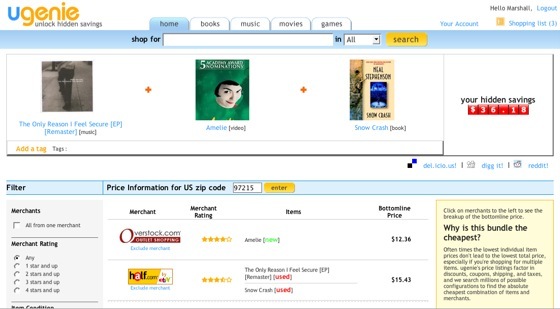 The UI alone gives the site a feeling of legitimacy that too many shopping search sites lack. Ugenie was built by Krishna Motukuri, co-founded Amazon India, former Senior Program Manager at Amazon Harish Abbott and Yahoo! India founder Bharat Vijay. The company received $5 million in funding from BlueRun Ventures and Sierra Ventures this summer.